. Published on September 27, 2018 . …And it didn’t go so bad. My first year of image making at Columbia was full of experimentation, failures, growth, insight, and major successes in the form of small steps. I made a ridiculous amount of images (as one should in grad school), which allowed me to get all the garbage pictures out of my head until some good ideas came out of it. I eventually found some clarity over the summer while thinking about my final review of the first year. Basically, final reviews go two different ways during the stages of your MFA career. In the first semester, your review is a recollection of the experimentation you’ve done during your time in the program. I showed everything that I made, even things I knew I would have no intention of pursuing later. That all went on the table. What I wanted to talk about I put on the wall. During your first semester final review, you don’t really get critiqued, instead, you get asked questions. Your second semester (and I’m assuming third semester) will be different; you have to edit a sequence of work. This work should be more focused, cohesive, and satisfying in quantity/quality. My review was rewarding and painful, in the most necessary ways. I spent a lot of my first year developing two projects simultaneously, trying to marry them together. One project consists of images, another text. I made a wallpaper installation to place under my images, however the conclusion from my board was the text contradicted the overall message of my images in its current form. No matter how hard you try to separate yourself from personal work in moments of critique, it seems almost impossible. That doesn’t mean that you don’t learn how to be objective about it in graduate school, though. I knew that the constructive feedback I was receiving was true, which is why it was easy to accept in the end. It stung a little to hear that the product I had worked on up to that point was failing—but I took it, sat on it, enjoyed my summer, applied to shows, and thought about the work critically and honestly. *Applying to shows is essential! Not just for professional reasons, but it forces you to really rethink how you talk about your work, and if your photos are really doing what you want them to. Calls to art require artist statements, a CV, an image checklist, and even a bio. All calls differ. Working on my artist statement really opened my eyes to the work I was making. I applied to seven shows over the summer, was accepted into five of them, and slowly starting making more images. I took more time than usual to be critical about everything I was fitting into the frame. I didn’t anticipate having a critique the first day of seminar of my second year, but I definitely expected to have one the following week. When I received the news that a select group, including myself, would be critiqued the first day, I was of course nervous. I felt more confident and excited to be vulnerable with my colleagues again. The overall structure of the critique sessions have changed since last year, and that’s because of the many professors we have in the Photo Department at Columbia. Each semester the two teaching professors will meet together to decide the structure of the seminar. My first year, we stuck to a 10-10-10 format. For the first ten minutes, the other graduates in the room have a discussion about your work, asking questions while the artist being critiqued and the professors remain silent. After ten minutes, the professors join in, and after twenty minutes, the artist. It’s terrible, because you can’t say anything about your work when people go off on tangents that have nothing to do with it. But that’s when it’s necessary and working: you really learn what your work communicates through cold reads rather than you attempting to sway thoughts with explanation. 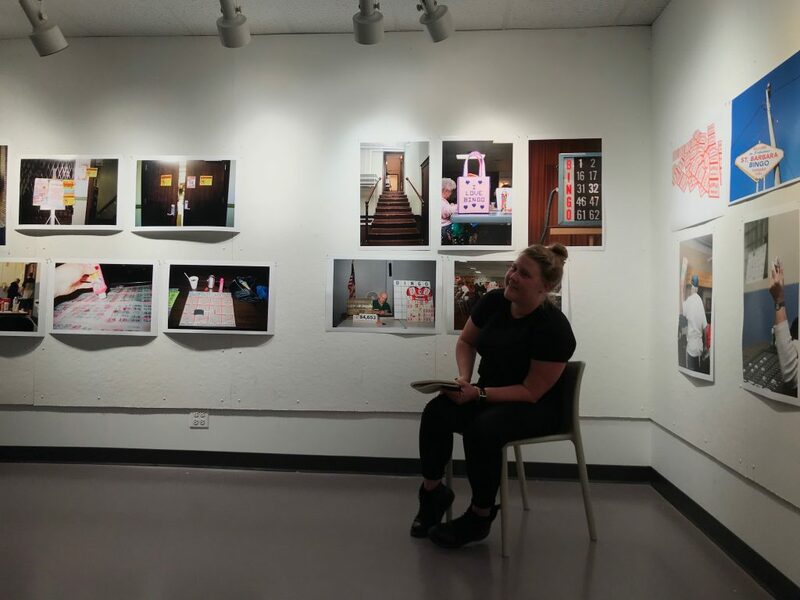 Kalin Haydon, MFA Photography candidate, receives feedback focused toward her thesis exhibition in December. This semester, we have forty minute critiques with a 10-10- 20 set up, and a minimum of 15 works. 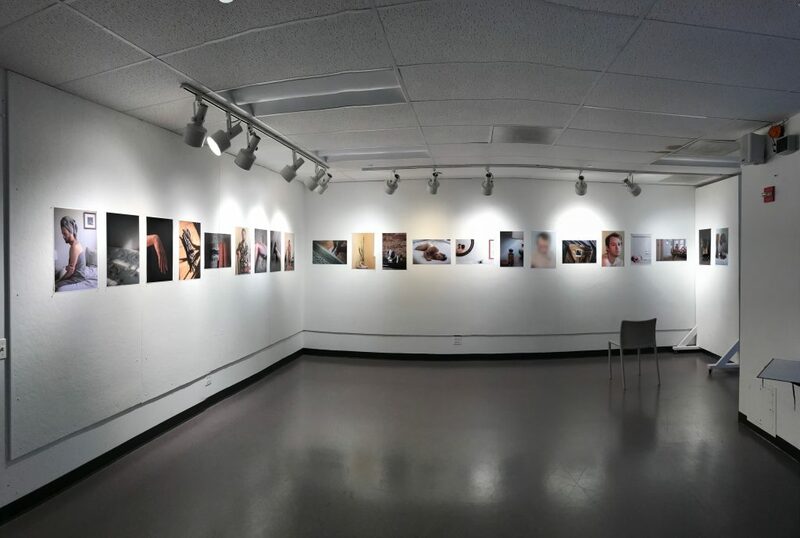 For my critique, I showed 22 images, 16 new and 6 old, in order to get a read on how my new work was functioning with my older. I was very surprised to hear that most of the feedback lining up with my intentions for the work. Great, tough questions were asked, and I’m excited to answer them so that the work can grow even further. Initially I was freaked about a critique on the first day, but it showed me where I’m at with the work and where it needs to go. I’m currently enrolled in a class called Body, Space, Image where I’ll be able to hone in on my text component and create a more interactive, performative piece. After two weeks of my second year having already passed, I think it’s clear there’s much to be done. 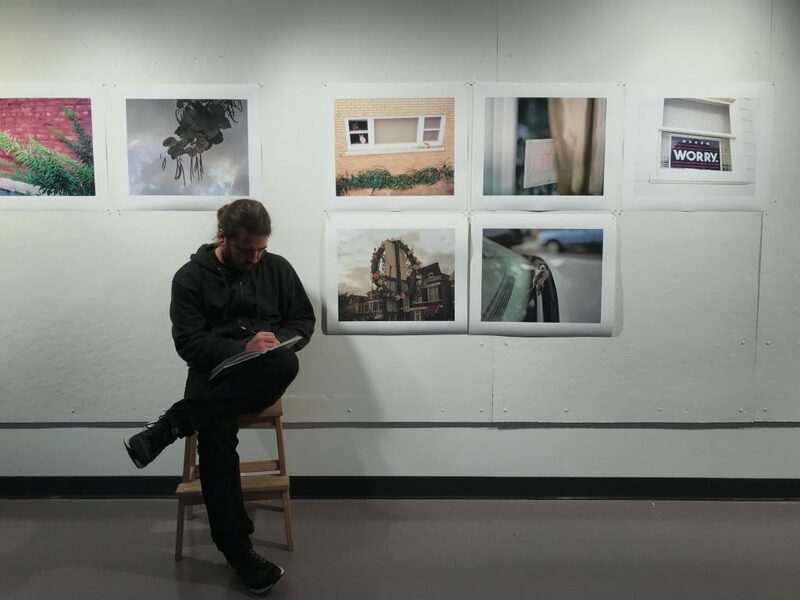 Levi Shand, MFA Photography Candidate recording feedback during critique.